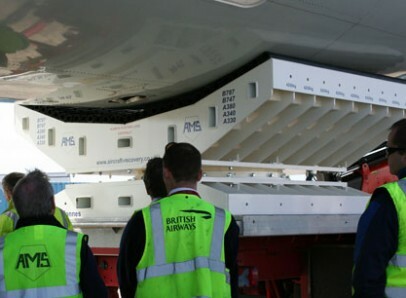 British Airways recently became the first customers to take ownership of the new AMS 50 tonne turntable. The revolutionary curved profile and buffer interface allows aircraft to sit within the bed of the turntable, reducing the point load applied to the fuselage so recovery teams can more easily centralise the load (with increased stability and control when towing). The photograph to the left shows how the rubber buffers provide security for absorbing high loads, reducing point contact to minimise secondary damage. AMS’s new aircraft turntable can be used with any multi-wheeled transporters capable of carrying the load, enabling disabled aircraft to be moved as if the undercarriage was still in place. With an increasing number of air fleets now purchasing the A380, this new turntable should be considered an essential piece of equipment for aircraft recovery teams, airport authorities and airlines.